Do you want to create a social networking website like Facebook? or want to build a social media site? but you don’t know where to start or no coding knowledge? It is easier than you think..! You no need to learn programming or anything extra. Just follow the below steps. 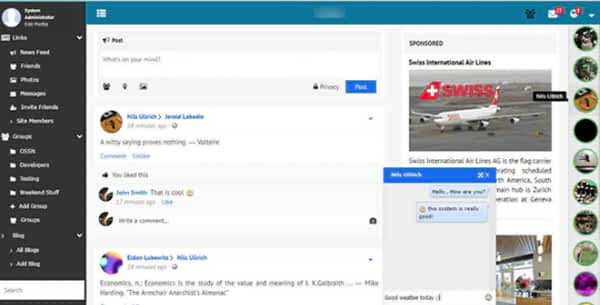 You can create your own social networking website like Facebook for your college or organization or public or any types you want. Today we have advanced software & tools, everything made easy. 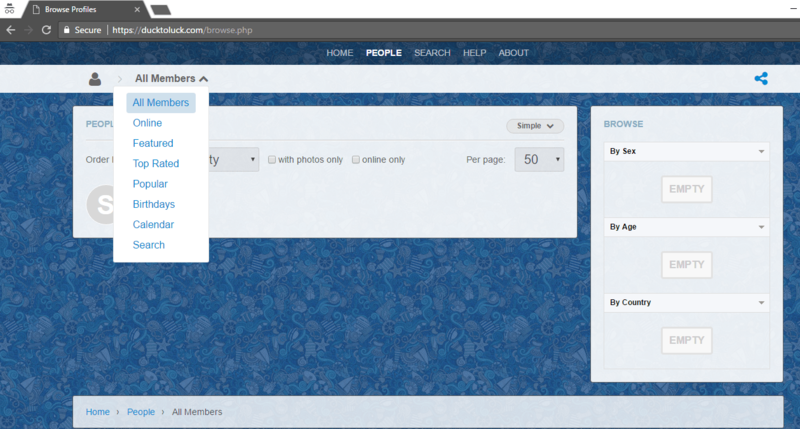 You can customize settings within the social website as your imagination to change the functions or anything. Just a few clicks are enough to do everything you want..! Even you can build a social website that makes money fast by using Google Adsense or any sponsor ad or games or subscription or any other proven online earning methods. (You can also see my real life story of how I became a big fan of Facebook founder Mark Zuckerberg & I wanted to create something like Facebook. I launched a social website on my college publicly at the age of 19 just because Zuckerberg also launched at the age of 19..!! exactly I followed how Mark did when he launched If you are interested in my life story, See –How I Created a Social Network Website & Made A Profit In 26 Days. This is my news – appeared on Deccan Herald. Okay, Let’s follow the 5 steps. I researched a lot on web hosting that should have the capacity to hold many concurrent users on the website without crashing the site. 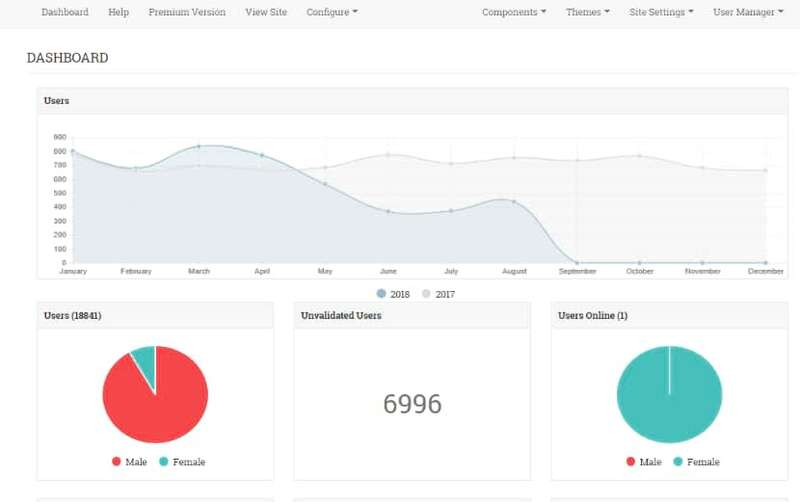 SiteGround hosting is more stable even from its starting plans. & if you expect millions of visitors, then here Siteground offers Cloud hosting, dedicated hosting and very high volume plans. 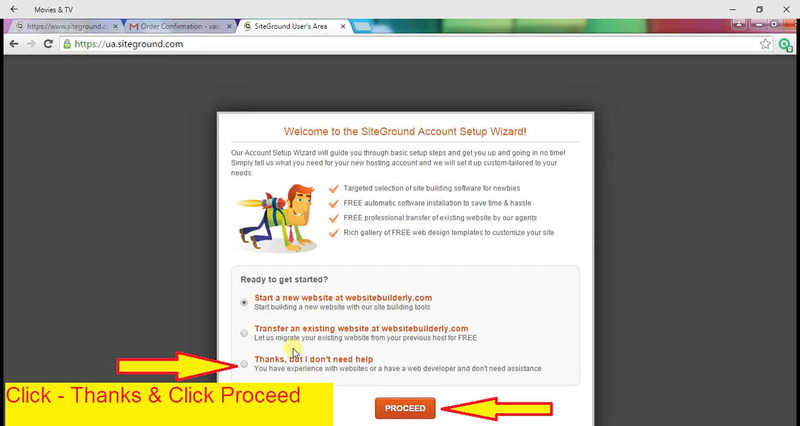 SiteGround is capable to handle your website even you get a huge unexpected traffic. Don’t buy the costly plan, Because if your site gets millions of traffic, then you can upgrade later or transfer to any other hosting. There are many different plans. I recommend GrowBig Plan $5.95 for your social networking site. If you assume, your website gets less than 10,000 visits per month, then order startup. But I recommend you to Order GrowBig plan even your website gets fewer visitors. Because you can create many websites and it included backup-restore up to 30 days and more premium features for free. However, If you choose the Startup Plan, then there is no harm. If you get more or fewer visitors, you can upgrade or downgrade the plan at any time. Once you clicked Order, you will see enter your domain page. The domain is your website name or URL address. Create your website name. Type any name you want to give your website. You are creating a social networking website, right? so I think it is better to choose .camp or .club domain extension instead of .com, .net, .org etc. The .com is so boring and also difficult to get the name you want. Because someone already registered the domain you wanted with .com. You can give names like www.badboys.club, www.NewYorkUniversity.camp, facebookhookers.xyz, www.usaphotographers.academy etc. 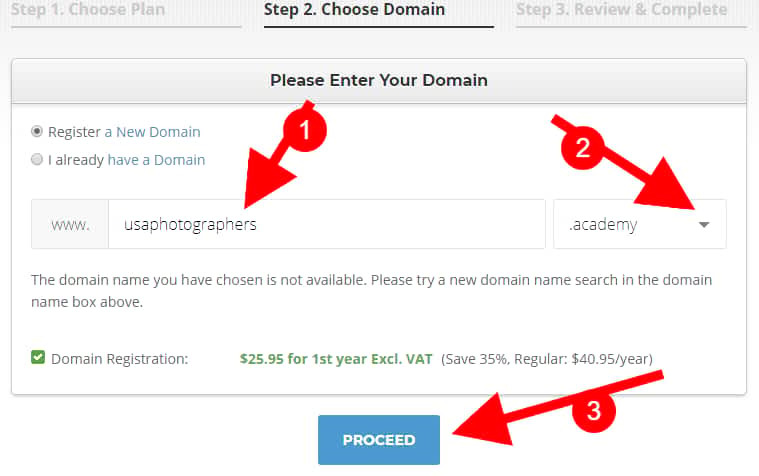 Usually, domain name costs $10- $15. Different domain name costs vary a little bit. For .com $15. But .academy like domain little bit costlier than others. Just enter the details. Give your email properly, because all information & receipt will send to that email after you paid. Choose a strong password with 8 or more character that included at least one Letter of lower & uppercase, number, and special character. Otherwise, you can’t pay. 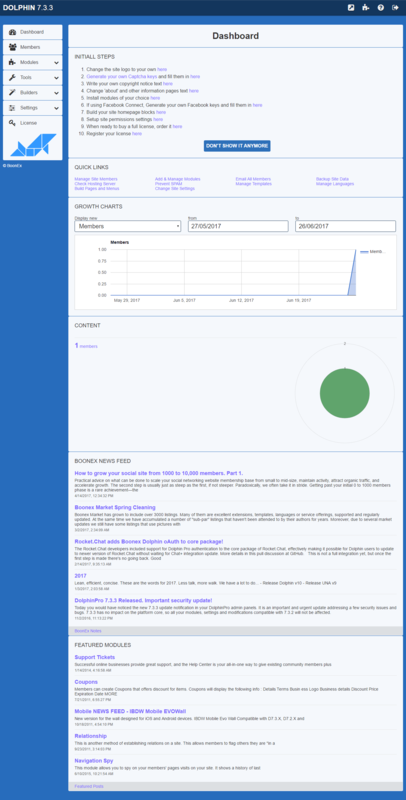 If you want domain privacy and hack alert monitoring, you can select it. Click pay now button. It takes some time. Once your transaction is completed, you will see “Your order successfully submitted” message. Then go to your email. 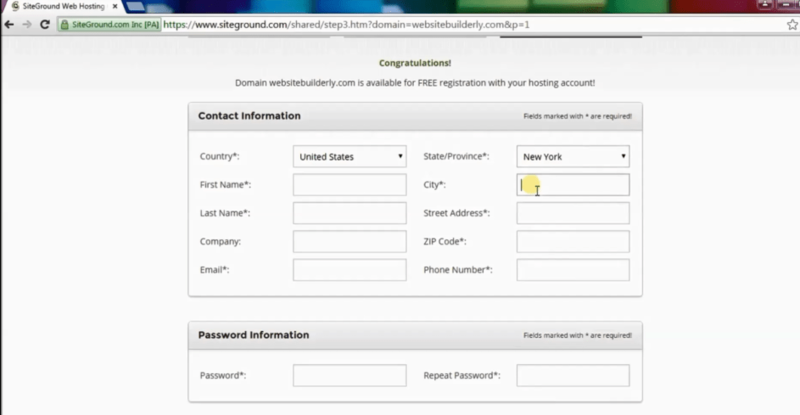 You will see your hosting account login information. Click login to customer area. Once you clicked login to customer area button, you will see enter your username & password fields. Enter & click sign In.. Once you entered, you will see this page. Don’t select the first & the second option. Click on the third option – “Thank, But I don’t need help” & click proceed. If you find any option, just skip it & you will see the Siteground dashboard homepage. Go to My Accounts, Click Go To cPanel. 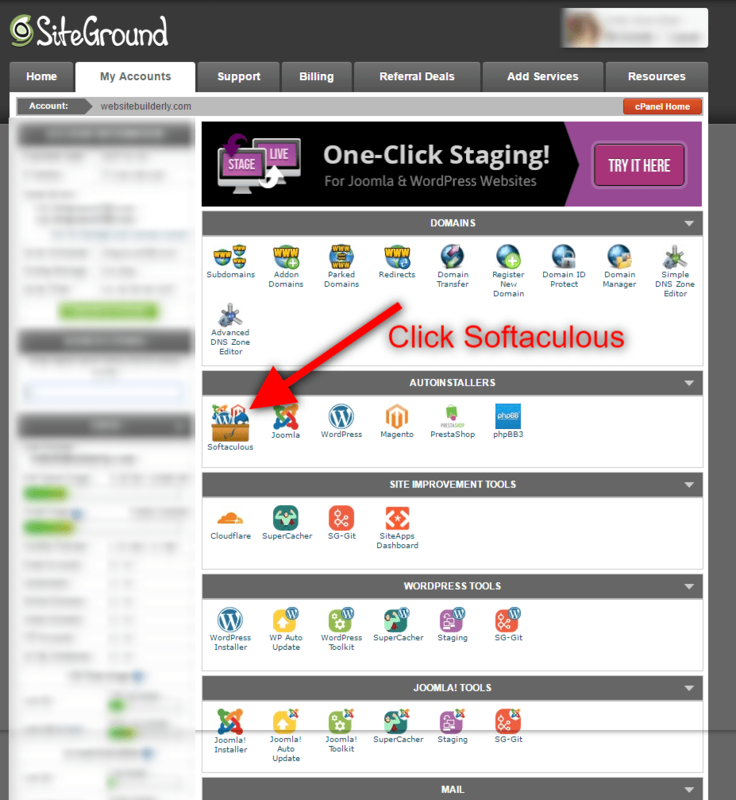 Once you clicked on softaculous, you will see many software categories. Look at the left menu. 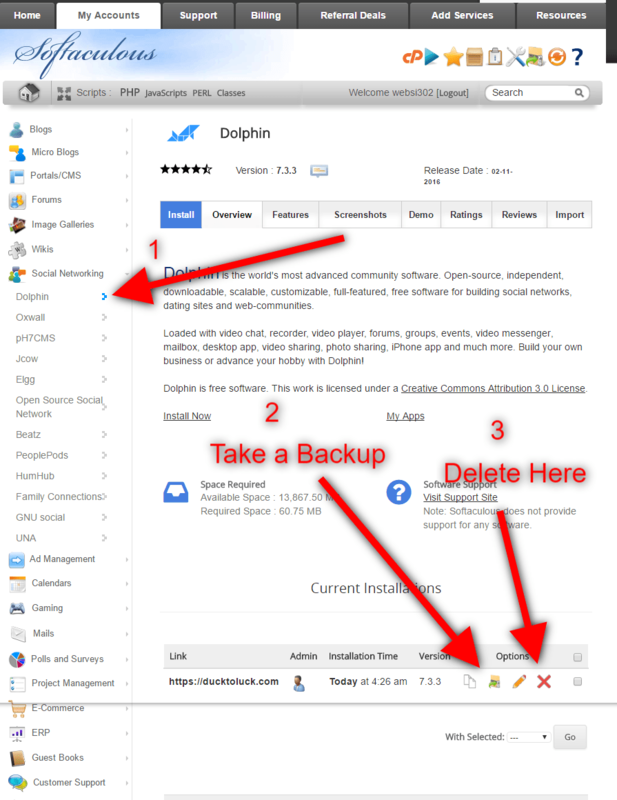 Click Social Networking Tab & click Dolphin. Once you clicked on Dolphin, you will see this page. Admin username & password are very important. Write down. You can change the admin username & password right here. But once you installed, you can’t change the admin username. So remember it. Click install. This is your admin login page. Type what is your username & password that you got or created on the very previous step. Once you clicked on login, you will see register button, but don’t click get a license page, because there is an option “continue trial”. So why you simply waste your money? click trial that I showed with the red arrow. 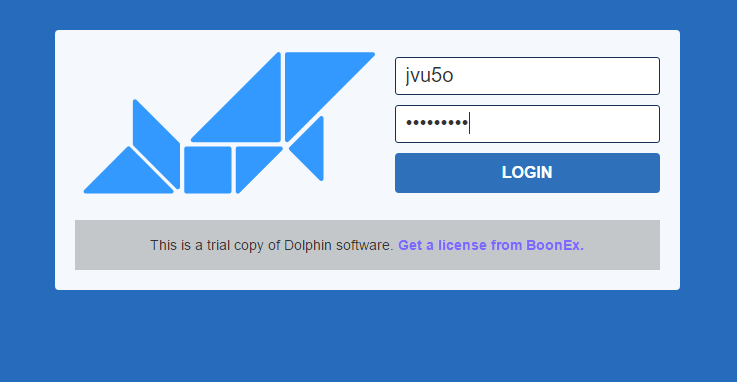 Click continue the trial with Dolphin, because it is enough, if you want to remove Dolphin copyright banner from your website, then you register or buy its license. once you clicked on trial, you will see this dashboard. You can customize these settings. All customization tutorial available on the dashboard itself. It is very easy. What all you need to do is just add, replace or rearrange the ready-made social web functions. You no need any coding knowledge. 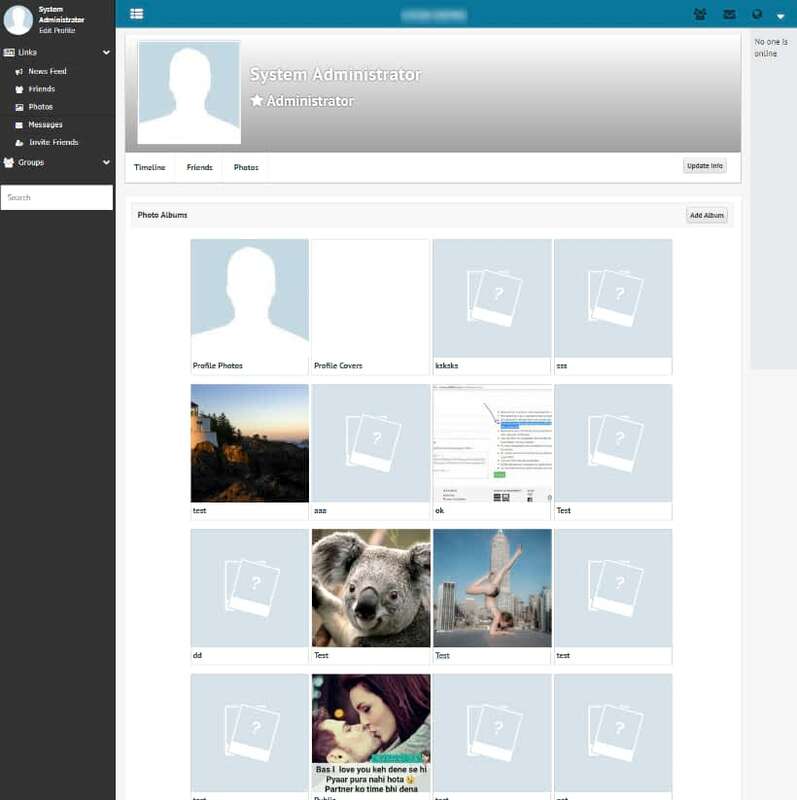 This is a view of dolphin social network website. You can add more functions for free. You can change or install different software. There are many free and even completely free forever social website software exists. If you want to see another one, first you have to remove Dolphin installation. I suggest you take a backup before removing it. So that if you want it again, you can restore it in just 1 click. So that all your previous setting will back. But taking the backup is not necessary if you just tested it. Because you can install it again at any time. 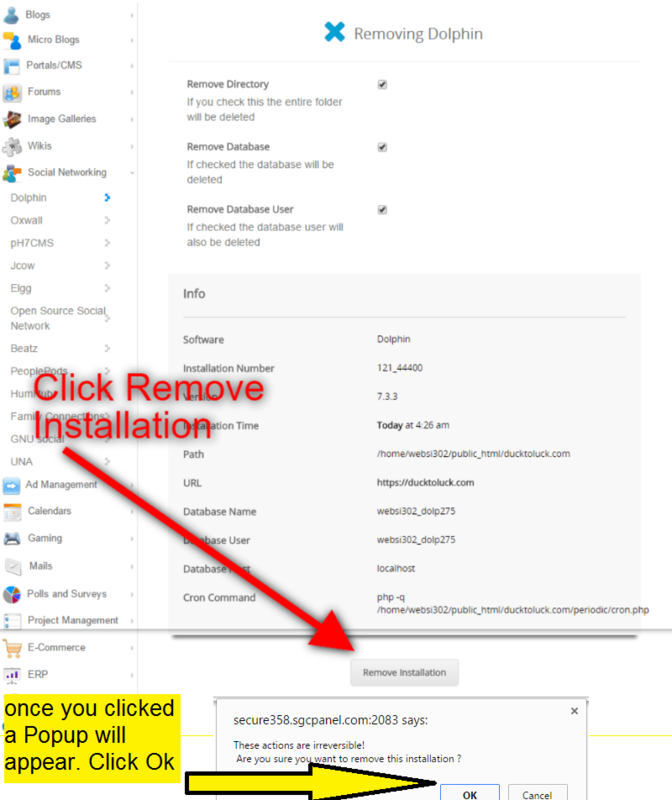 Once you clicked on to remove the installation, your browser will pop up & give you a message – “These actions are irreversible. Are you sure you want to remove this installation?” Click ok. The deletion process takes just 5-10 seconds. Once the deletion process is completed, go to another software. If you want completely free forever with all options, I suggest go with open source social network. Next click to the homepage you will see similar to like this. Here are essential social profile features. You can control all users profile or activity. You can ban or delete anyone’s account. Because you are the owner of the social website and you have the 100% control over the website..! You can add many premium features. After you get some accounts, then it looks like this screenshot. Now you can share your own Facebook-like website with your friends..! If you don’t like this, you can change it again. You no need to delete the website. You can create a new website without paying anything extra. Just add a subdomian & install another social network software to that sub domain to test it. 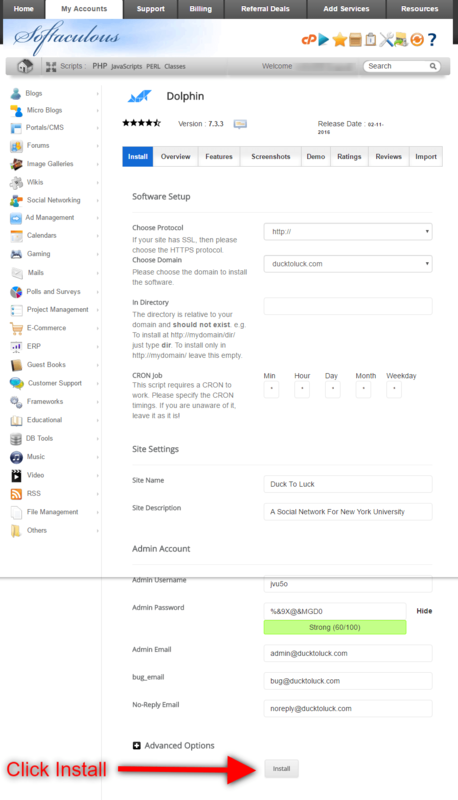 SiteGround provide you unlimited sub domains for free. You can buy new main domain. Go to Add services & check domain names. If you got any doubts, comment below & get a response within 24 hours. If you got any problem while you are installing a social website, then you can get support from Siteground. They provide you 24X7 live chat support & ticket system. I suggest ticket system because you can view it anytime. But in chat, once you close, everything will delete. Is it possible to turn the site into a wholesale market where people can advertise what they are selling and in order for them to be a marketer they have to pay a fee.. Similar concept as alibaba.. I came back to work & usually, I don’t take a break. We can convert your website (any type of website) to ios & Android app. Feel free to contact us or reply here. Good morning Sir Please Sir how can I make money with my social website. How can I create a Ponzi scheme website A peer to peer Ponzi site like mmm. Hello Admin! can i make money from people through advertisement placement with any of this program and how will the money from the ad get into my account. Once you created your social website using the above guide, then share your website on other social media, promote & get some visitors. Then just apply google Adsense. Once they approve, you will get infinite ads continuously & generate passive income while sitting on your home. But if you don’t get enough visitors, then you may not get enough earnings.